This week I conquered part 1 of an epic novel: Atlas Shrugged. I wanted to make sure that I at least got the first part of the book completed, so I could write about it and generate some excitement for the movie coming out April 15th. The book has been a bestseller for years and years and that's widely because the ideas in this book are timeless. I wish it weren't the case, but it is. I say that because the book is about government interaction within industry and how the more the government regulates the more it destroys the industry. The book is about 1200 pages and is Ayn Rand's longest and last book. She is a genius woman! The story widely surrounds a character, Dagny Taggart. She is the VP of Operations for her family's once great international railroad. In the first part of the book you watch as Dagny gives blood, sweat, and tears to make the railroad survive. Her brother, Jim Taggart, is the face of the company and not much more than that. He lacks all business sense and both directly and indirectly makes decisions that hurt the railroad. Then there is this guy Hank Rearden who makes a new type of metal that is better than steel, but of course everyone is uptight about it because it's not 'fair' that Hank gets to profit from his new metal and the steel mills are worried he is going to put them out of business. So they run a smear campaign to tear down Readen Metal and when that doesn't work because Dagny still uses the metal to make the tracks and bridge on her new railway they come up with legislation to slow him down. At the end of Part 1 there is all types of legislation introduced that puts really challenging barriers on many companies: The railroad, Rearden Metal, and oil fields. This is the the mega-cliffnotes version of course. The book has so much going on and so many underlining concepts. I have never been so obsessed with a piece of fiction before now. The book is so expansive I can't dive in any more than this without writing a novel of my own. But I hope you read it because you can see some wonderful/bittersweet parallels between the book and what is happening in the US right now. I want to leave you with two video clips... The first one is the movie trailer for Atlas Shrugged: Part 1 and the second is Ayn Rand speaking about free markets. WATCH THEM BOTH. I hope you watched both of these, you won't regret it. 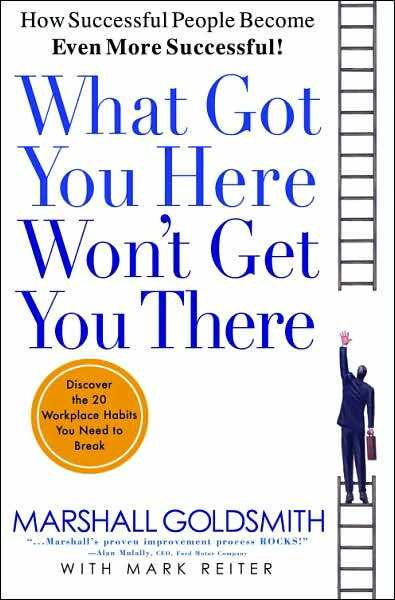 The book of the week was What Got You Here Won't Get You There by Marshall Goldsmith. This book has a lot of merit. I was most interested in the '20 Habits You Need to Break.' There are quite a few that I can even see I do and something I should work on stopping and without reading that it's a bad habit I never would think to stop doing it. Often in the leadership world, our coaches spend all their time teaching us the things we need to start doing, but seldom is there any emphasis on what habits we should stop doing. And it's very important if you want to make a jump from middle management to upper management. The higher you get up the ladder, the more well-rounded you need to be. You can't just be technical or just be a good communicator. You need to have the whole package to set you apart from others. It's not uncommon to see a few traits listed that apply to you. It is your job to notice these flaws and work to correct them. I know I'm going to! This book was good. There are a lot of examples that help put these habits into context. As always, if you have any questions on the book don't hesitate to ask. I would be more than happy to help anyone that wants it.